Mass flow regulation with closed loop: The Flow controller is an application for control of constant material flow rate. 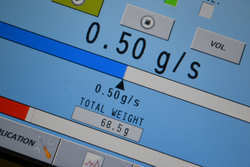 The flow rate is calculated from the weight change in the batch hopper by means of statistic functions. A PID – controller determines a control output value from actual flow rate and flow rate set point. This value controls the discharge system via an analog output.